Emily Chung, CBCNews.ca's regional journalist for Ottawa, is spending seven days on the Canadian Coast Guard Ship Amundsen, a scientific research icebreaker in the Amundsen Gulf. Sometimes toward the end of your trip, you think about the things you haven't seen and realize you're unlikely to see them unless you come back again. And then at the last minute, they surprise you. The first surprise comes at 1 a.m. when I am lying half asleep in the upper bunk of the cabin I share with a graduate student named Lauren. The phone rings. It is Second Lieut. Olivier Tremblay calling from the bridge, asking if Lauren is there. "I don't think she is," I say. Tremblay explains that Lauren asked him to call if there were northern lights. "And they're happening up there now?" I ask. I had only seen the northern lights once, while in a car heading from Edmonton to Vancouver. And those - no offence to them - were a little feeble. So even though the phone message is for someone else, I jump out of bed, throw on my clothes, and tumble out the door. Tremblay and I nearly collide at the foot of the stairs. He advises me to grab a coat, so I throw on a few extra layers and run up several flights of stairs to the bridge. Once there, I go outside to the deck on the roof of the wheelhouse, where about a dozen other people are gathered, including many of the Schools on Board kids. The show is spectacular. Green light layered with pink is rippling through parts of the clear, dark sky like ribbons, mist and curtains blown by the wind. Unfortunately, I am unable to sort out the settings on my camera to take a good photo, but I take note of who among the other spectators got some good shots. I return inside when I can barely feel my fingers and toes. The next morning, there is another surprise, but this time it's not a good one. Overnight, the plate of ice in which the ship is embedded has broken in half, opening up a "lead" of water between the Amundsen and a research sled laden with more than $125,000 of monitoring equipment. The two scientists whose data is being collected by the sled, Ralf Staebler of Environment Canada and Phil Tackett, a graduate student at Purdue University in West Lafayette, Indiana, hadn't expected that. There was little wind last night, and the currents hadn't seemed risky either. Still, the equipment can't be left to drift off on its own. In fact, a previous version of the sled suffered critical injuries when the plate of ice it was on collided with another plate of ice in Barrow, Alaska, three years ago. 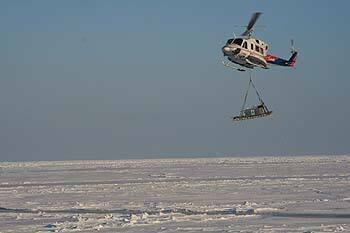 Fortunately, a helicopter is deployed to rescue the current sled. The operation goes quickly and the sled is soon safely back on board the boat. The third and final surprise comes during the mid-afternoon, after I emerge from a tour of the ship's engine room with the Schools on Board kids and the two grad students next door. 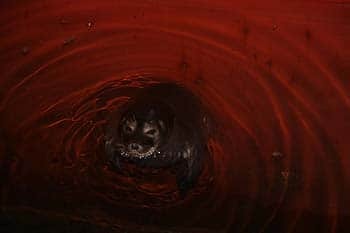 News is whipping quickly through the ship – there is a seal in the moon pool. That has reportedly only happened once before during this mission. We make a run for the moon pool room, where spectators are crammed around the railing. The technicians move some of the equipment to make more standing room. We stare down into the green ocean depths below and see nothing. Then suddenly, a shadow appears in the water and rises quickly toward us. The seal's whiskered muzzle breaks through the surface as flashes go off one after the other. The seal - a young one barely bigger than an obese basset hound - looks around, but seems unfazed by the mob of paparazzi. It stares at us, blinks, inhales the warm air for a few minutes, then dives again. It visits again every 10 minutes for about an hour until everyone's camera (including mine) is filled with seal photos that need to be downloaded to a computer. Tonight is my last night aboard the Amundsen. Tomorrow, I will fly back to Ottawa via Inuvik, Winnipeg and Quebec City. 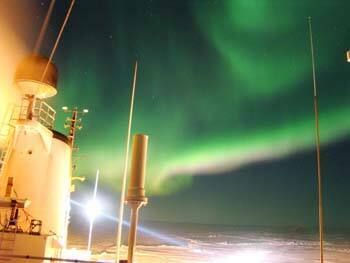 I'll be posting more details about the science on an Arctic ship when I get back.